A woman who missed her stop struck the bus driver, causing him to veer off brifge. 15 are presumed dead. 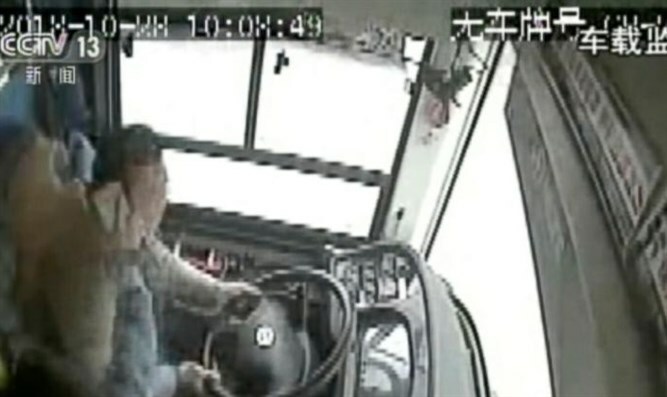 Recovered footage from a bus’s black box showed that a fight between a female passenger and the driver caused an accident that killed at least 13 people in China on Sunday. The bus plunged off a bridge into the Yangtze River in the southwestern city of Chongqing, after veering into oncoming traffic. The video recovered from the bus, which was released today (Friday), shows the bus driver in an altercation with a female passenger in the moments before the accident. Thirteen bodies have been recovered but all 15 people who were on board the bus are presumed dead. A statement from Wanzhou district police said the 48-year-old female passenger asked the driver to pull over after she missed her stop, but he did not do so. As the quarrel escalated, the statement said, the woman struck the driver on the head with her cellphone. The driver grabbed her arm when she attacked him again, then steered to the left, sending the bus out of control.